Quantum memory is one of the basic building blocks needed for realizing a quantum computer one day. Atac Imamoglu, a professor of quantum electronics, and Renato Renner, a professor of theoretical physics, examined the issue of whether there can be long-term memory for quantum information at all using numerical models and theoretical analyses. In doing so, they studied one of the most promising candidates for storing quantum information today: so-called topological memory. Currently, it is almost impossible to store quantum information for more than a fraction of a second. If the information carriers of the quantum memory are disturbed by an incident photon from outside, for instance, the information is irrevocably changed. Such interference can also influence classical information. 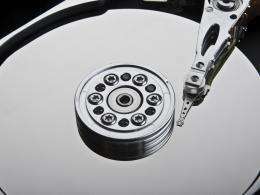 However, classical memories, such as a hard disk, have a kind of self-protective mechanism: as every data bit is stored on thousands of tiny magnets that have a magnetic field, an individual magnet that has accidentally been aligned wrongly through interference is automatically turned back in the direction defined by the magnetic field. The data bit is copied into little magnets a thousandfold, which stabilise each other. In the last decade, scientists have been studying the possibilities of topological memory for long-term storage of quantum information in theory. The memory could be constructed from a number of atoms or electrons, arranged in a torus, like a lifebelt. The information is stored on it in that individual atoms or electrons of the torus develop around the torus like a sort of elastic band. The possible states of a bit, 0 or 1, are then represented by two different geometries of the elastic band. The fact that the data is stored in a geometric form and thus distributed spatially has the advantage that interference factors, such as an incident photon, do not change the information as they only have an effect locally. According to the scientists, it would thus be possible to construct an error-resistant, long-term quantum memory without having to copy the information and it thus becoming classical. Some years ago, however  through the collaboration between theoretical and experimental physicists  individual research teams recognized that a local disturbance of the elastic band in which the information is contained can move. Visually, the disturbance could grip the elastic band in one spot and wrap around the ring a second time during its walk around the torus. The geometry would thus change completely  and therefore also the information it represents. At the same time as a research team from the School of Physics and Astronomy at the University of Leeds (UK), the ETH-Zurich researchers have now found a method for preventing interference during the walk and fixing it on the spot. Both studies were published in the latest issue of Physical Review Letters. Its easier to slip on a smooth ice surface than a roughened one. Its a similar story with the interfering photons: they can walk through the homogeneous surface of a topological memory much more easily than an inhomogeneous surface. When the scientists now deliberately add little irregularities to the torso and thus roughen up the surface, the interfering particles can no longer move as easily. The effect of the rough surface is called Anderson localization. In order to roughen up the surface, the torus might be exposed to a continuously changing magnetic field, for instance, which changes the properties of the atoms locally. These local changes restrict the movement of the interfering particles without compromising the data stored. Both teams demonstrated this in numerical simulations; the ETH Zurich researchers also managed to provide mathematical evidence. The question now is whether it will be possible to produce the basic building blocks the memory torus consists of in future. Experiments are being conducted at ETH Zurich to look for suitable materials, says Renner. However, he also stresses that it is early days yet for the research. Imamoglu, Renner and their teams are involved in the Swiss research organisation Quantum Science and Technology (QSIT), which was nominated as a National Centre of Competence in Research at the beginning of the year and is to support the exchange between the thirty-three research teams in the field of quantum physics (see ETH Life, 3 February 2011). For the two professors, the result of the joint research now published is proof of just how important the organisation is. Its only the exchange between theoretically and experimentally oriented research teams that made it possible to recognise the problem of moving interference in the first place, Imamoglu and Renner are convinced. Lode Pollet, an SNSF postdoc at the Institute of Computational Physics at ETH Zurich, carried out the numerical analysis. First author Cyril Stark, whose doctorate was supervised by Imamoglu und Renner and funded by QSIT, was the link between the three research teams.